February 15, 1917: Municipal Journal editorial. Sewer Pipe Failures. “There is probably no type of structure or kind of material that was not at some time figured in a more or less complete failure. In most cases such failure is due to carelessness or ignorance in the use of the material and not to the fault of the material as such. Concrete bridges have failed, so have steel and wooden ones; yet each properly used has given most satisfactory service in hundreds of cases to one in which it has failed. The same comments apply to the failures of sewer pipe described in this issue. Thousands of miles of vitrified pipe and hundreds of miles of cement pipe (the latter having come much more recently into general use) have given and are giving satisfaction in the sewerage systems of this and other countries. That there have been failures is only a repetition of the history of all materials. But it is desirable to occasionally call attention to such failures as a caution against careless or ignorant use of the materials, or to enlist all those interested in a study of the cause of the failure. 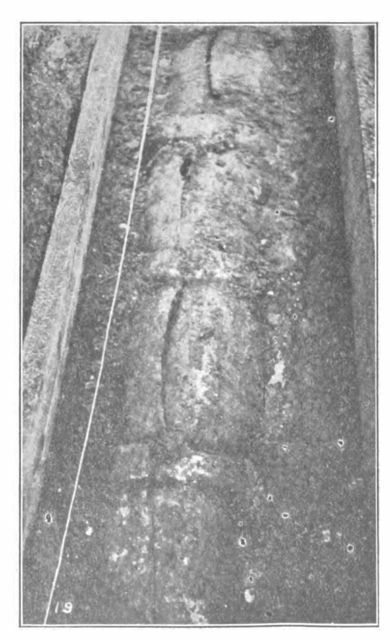 In the case of the vitrified pipe it appears from the illustration, that the pipe was laid close to the surface of a street carrying heavy traffic (assumed from the fact that the street was paved with stone block), that the reconstructed base over the trench failed to support the load, which was thereupon transmitted to the pipe. In the case of the cement pipe, the reason is not so apparent; but it would seem probable that that advanced by the engineer is correct-that the pipe was sufficiently porous to permit ground water to pass through it, and that in doing so it dissolved certain constituents of the cement (or possibly of the sand or broken stone used as aggregate). It is certainly desirable that the cause be ascertained in order that the manufacturers of cement pipe may avoid its future occurrence. Reference: “Sewer Pipe Failures.” 1917. Municipal Journal 42:7(February 15, 1917): 237. This entry was posted in Year 7 TDIWH and tagged backfill, concrete pipe, public health, sewage, sewers, vitrified clay pipe, water history on February 15, 2019 by safedrinkingwaterdotcom.